We have been Down The Islands AGAIN! Another public holiday in the land of perpetual bliss. Does the fun never stop? Do these people ever get any work done? Is it all about fun and merriment? In case anyone is new to this blog and wants to hear all about work, traffic jams, exhaustion, stress, fast food, homework overload and parental juggling, they will need to scroll back a few months. Don't look here now. We intend to remain completely irresponsible until September. Thank you. So we've been fishing, wallowing in the sea and snorkeling. The boys and I came home because there is "Open House" at Ajoupa Pottery, and there is much work to be done in the morning. And then we'll head back Down The Islands, till whenever. We are trying to visit Gasparee Caves, because Lou's photos of Caves this week had me in awe and I want to show the kids some real caves. Unfortunately, (or fortunately, for eco-reasons) it is very difficult to get to see the caves. Our fingers are crossed for Sunday. If we don't get to go, we will just have to fish and snorkel all day instead. I will let you know how it goes, and post plentiful pictures. I hope everyone's Corpus Christi weekend has been excellent! Man, the word JEALOUSY comes to mind. But it isn't really strong enough. Aaahhh!!!!! I want to come home! Have fun & be safe! Give the boyos a big hug 4 me. I wish I could have gone with you - but thanks for the the very flattering mention in your post. I enJOY your blog very much! I love how you are celebrating summer with your family! Happy Monday! 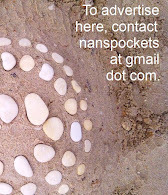 I found out from my ex-bf that you were looking for me... my email is perkyshai-at-gmail. Wow, it's been FOREVER since I've seen you.